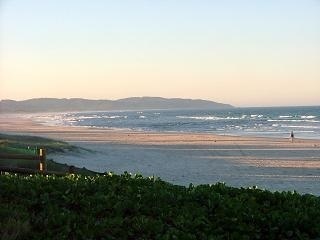 Lennox Head is similar to how Byron Bay was 20 years ago. A small friendly surfing village tucked under a huge headland. Still pretty much undeveloped but changing fast. 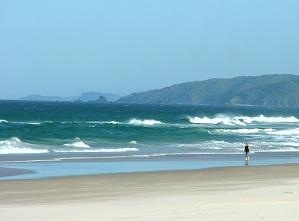 Lennox lies just 15 km south of Byron. We head down often (a little too often) for dinner at one of the restaurants - our favourite is 'Mi Thai' at 2/76 Ballina Street one of 2 Thai restaurants in the village - the food is great, the staff friendly and in summer the tables spread out over the pedestrian area and gives it a real 'Mediterranean feel'. Lennox survives mostly on tourism but still has a very village atmosphere and some great cafes, shops and restaurants - but not too many, it's a lot quieter here than in Byron Bay. 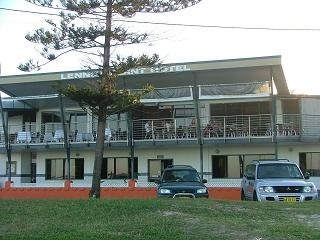 The village has one pub - the Lennox Head pub where you can soak up the ocean views over a drink, have lunch or dinner or place a TAB bet if that's your thing. The village is slowly growing with suburbs now spreading back into former dairy farms - but the village centre does retain a certain charm. It feels much smaller and suffers less from Traffic congestion than Byron as it has a bypass so only traffic actually using the village passes through. Seven Mile Beach runs from Broken Head to Lennox - a great walking beach or if you're feeling really lazy you can actually take your vehicle onto the beach - 4WDs only though and not when there's a strong Easterly blowing fresh dry sand up the beach making it more likely you'll end up getting stuck - not a good look - you have been warned ! 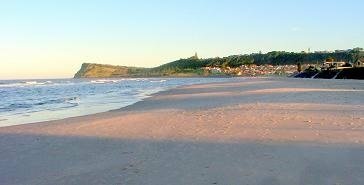 Seven Mile Beach is a Dog friendly beach and in the early morning and late afternoon, the beach is like a highway of people power walking, jogging or walking the dogs. At the south end of Lennox Head there are protected swimming areas with lots of reefs for snorkling. As you head north it opens up into the big exposed expanse of Seven Mile Beach with lots of parking areas and various favourite spots. 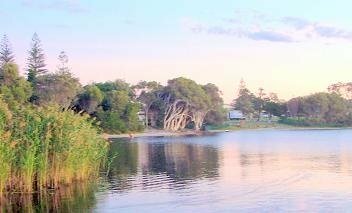 Lake Ainsworth is an amazing fresh water Tea Tree lake that serves as a great refresher after hours of body surfing in front of the Surf Club. The Water takes a bit of getting used to as it is stained black from the Tea Tree leaves but is pristine and addictive. The Holiday Park is regularly booked out by the same families each holiday season. The atmosphere is like a big family carnival. There are lots of BBQs and tables for the day visitors. 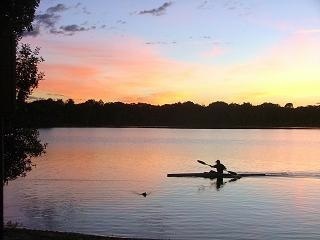 On windy days Lake Ainsworth is a spectacle with the sailboarders and windsurfers making good use of the water. Lennox Head is a very chilled out place with a relaxed vibe, great surf, great pub, cafes, restaurants and of course, the lake. It's our local village and still our favourite - it might be yours too..